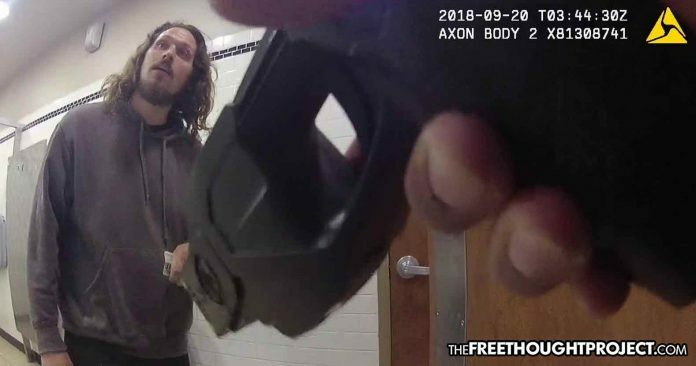 For walking across the road in a manner not fit for the police state, otherwise known as jaywalking, a man was followed into the bathroom by police and killed. Eagle Point, OR — A family is heartbroken this week after learning that the officers who took their son’s life will not be charged and were ruled justified in his killing—over improperly crossing the street. Matthew Graves, 33, was shot in the back twice by police last month after they followed him into a Carl’s Jr. bathroom because they suspected him of jaywalking. Prior to his interaction with police, Graves was unarmed, had harmed absolutely no one, had no warrants, and was simply walking to Carl’s Jr. to get a bite to eat. However, because he crossed the road in a manner not fit for the police state—otherwise known as jaywalking—Graves would be killed in cold blood by public servants and die on the floor of a fast food restaurant bathroom. The incident happened on September 19, but the body camera footage was only just released. It shows Officer Daniel Cardenas, an Eagle Point officer for two years, follow Graves because he allegedly crossed the road outside of a crosswalk. According to Eagle Point District Attorney Beth Heckert, officer Cardenas followed Graves to the fast-food restaurant because he intended to talk to Graves about the dangers of jaywalking. Instead of informing Graves of anything, however, Cardenas walked into the Carl’s Jr. and pulled his gun on the diagnosed schizophrenic causing him to panic. As TFTP has reported on numerous occasions, police reactions to schizophrenics often lead to their deaths as police only know how to yell and escalate violence, two things which are known triggers for the mentally ill. It was later determined Graves was unarmed and had no active warrants. Graves’ father told jurors his son has been diagnosed with schizophrenia and hadn’t been taking medication for years. The officers testified that Cardenas used a Taser on Graves after Graves put his hands on him, that the stun gun had little effect, that Graves punched Davis soon after he got into the bathroom, and that Graves managed to Tase Davis with Cardenas’ unholstered Taser. They also said that Davis told Cardenas twice that Graves had a gun and that Cardenas shot Graves twice in the back. The officers later realized Davis mistook the Taser for a gun. The officers’ Tasers and firearms were both black and could have been easily confused in the chaos, Heckert said. Grand jurors suggested officers’ Tasers and firearms be different colors, and Police Chief Darin May said Wednesday that it would be something he would look into. As the disturbing video below shows, Cardenas was the instigator and Graves merely wanted to get a bite to eat. Graves was simply washing his hands when the officer barged into the bathroom with the gun drawn—over jaywalking. Within seconds, Graves was in panic mode as Cardenas shot him with the taser for trying to exit the bathroom. Moments later, the two were on the ground as Officer Clarence “C.J.” Davis arrived to help Cardenas. As the two officers held him down, we hear “he has a gun,” before two shots ring out. He had no such gun. After shooting Graves, the officers realize that fact. When Cardenas asked where the gun Davis mentioned earlier was, Davis said that the officer’s taser on the ground could’ve been what he saw. For walking across the street, an unarmed and arguably innocent man was killed in a bathroom by public servants, and the system calls this justice—a tragedy indeed. Sadly, she now knows her son was killed for no reason at all.